"I've discovered a dozen oils I likely bought 1979-1982 at the Boston store and misplaced. The couple I opened looked nice. None of the tubes are unusually stiff. The Titanium white oozed oil. Some have taller caps and the tube tops looks dull and might read Utrecht Linen Inc. Maybe a different metal? Is there any reason these paints shouldn't be used for serious work. If usable would you suggest I retube them? Were colors at that time as archival as today? Would you expect the colors to be reasonably close to a new tube?" "Linseed oil is at its peak adhesive power when fresh, but it can have a very long shelf life. While it's possible the vehicle may have diminished somewhat in quality (impossible to say how much), if the paint appears to have the normal consistency and even sheds excess oil, it's probably fine to use. We have always used top quality pure pigments, and while global sources have changed in some cases, the colors will be dense, potent and lightfast (permanent pigments don't lose lightfastness in the tube). The biggest difference will be with Burnt Sienna; terrestrial sources for certain earth colors are becoming played out, and in the case of Burnt Sienna years ago we began to see unacceptable variation in color from batch to batch. Rather than offer an inconsistent product, we reformulated to use a synthetic red iron oxide to offer similar mixing properties with much more reliable color. The new product has a darker mass-tone appearance, higher tint strength and greater transparency. I think the rest should be similar to new paint. The tube is aluminum, but it's probably oxidized and looks dull. I don't think there's any reason to re-tube based on appearance; the interior of the tube should have been unaffected. Stretching the limits of memory, I believe we used uncoated tubes for oils and coated for acrylics at this point in time, but regardless, if the paint did not oxidize, I think there's practically no chance the interior tube surface was affected. I hope this helps; thanks for your question!" I recently won a set of Michael Harding oil paints (more on that later when they arrive... yup, I'm excited...). It's great timing since I've been preparing to stock up on oil paints. I had all of the oil colors I now need 30 years ago while studying with Acworth, NH painter Jerry Pfohl. He sadly passed away in 2010 at age 81. His renovated barn studio is incredible. Anyway... The tubes were packed for the move to Florida in '82. I switched to acrylic after a long break from painting and lately I've decided to return to oils. Surely those old oil tubes must have been lost or tossed or given away. The only thing I was sure of is they never entered the studio. What are the odds I'd find them 30 years later as I'm preparing to purchase new tubes? Well... right next to some jars of dry pigments (same vintage), in an old chest I walk past many times a week in the house, was this stack of paint tubes. I wondered if the old oil paints were still suitable for serious work. The few I opened looked good except for the Titanium White had oozed out the cap. 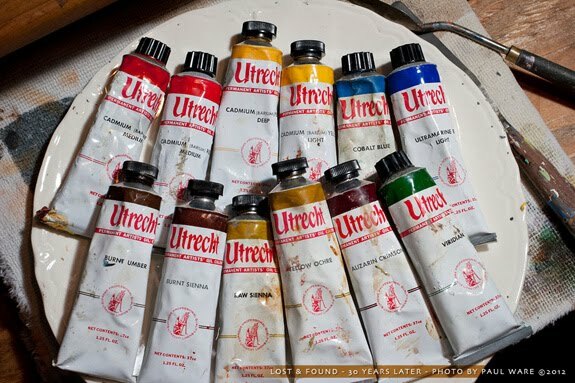 Thankfully Utrecht still mills their own paints in Brooklyn. A few questions sent off to the Utrecht experts gave me the answer I hoped for. Stay tuned for the Q&A about the tubes as it includes some interesting insight. The 10th Anniversary Horse Fever project wasn't my first time painting on a nontraditional curved surface. In 2003 and 2004 I explored violins. The close up nature scene is something I had in my mind for a long time, inspired by the plants and critters around the studio and down a woodland path. It captured a moment in time, letting you explore a small patch of earth that might easily go unnoticed in our busy lives. This violin was part of the Ocala Symphony Orchestra's wonderful "Flight of Fiddles" exhibit featuring exciting painted violins created by many of the talented regional artists. The Appleton Museum themed violin was used in an auction to help raise funds for the museum which was struggling at the time. The community came together in support. I don't believe the fiddle was exhibited after the auction so here's a peek. If you are familiar with the very long fountain in front of the museum you might see something special in the clouds. While at the On The Balcony exhibit last weekend a friend and very talented artist asked what inspired me to paint Days Apart. It's a great question since a caterpillar and Pawpaw blooms isn't the typical floral subject. Lots of folks know me as a graphic artist and photographer. Some know I paint and draw and others seem surprised. I can't imagine being a graphic artist without good drawing skills. What many folks don't know is I have long been interested in plants and gardening. For years I belonged to the American Camellia Society which has a local chapter and the American Azalea Society in order to learn more about hybridizing goals and plant attributes. I'm crazy about azaleas and did some evergreen azalea hybridizing many years back. Our last move turned my gardening world upside down, loosing the shade and good soil I had taken for granted. So instead of forcing my favorite plants on this plot of land I decided to take my cue from what was thriving naturally. When we moved from our last house we only brought a few specimens. The one original azalea hybrid I moved with us has flourished against the odds. Our current location is an often dry, sandy, pine/oak scrub micro climate which makes a formal landscape high maintenance. Near the studio you immediately see oaks and pines, a few black cherry trees and weedy Mimosa thickets. A closer look, beyond a few common nursery plants, reveals a rather diverse assortment of native trees, bushes, perennials and vines. Something is always flowering or putting on a show of color. Lots to inspire. Why a Pawpaw? Pawpaws are not well suited to nursery production, not fast growing or easy to relocate with a tap root that can reach twelve feet. 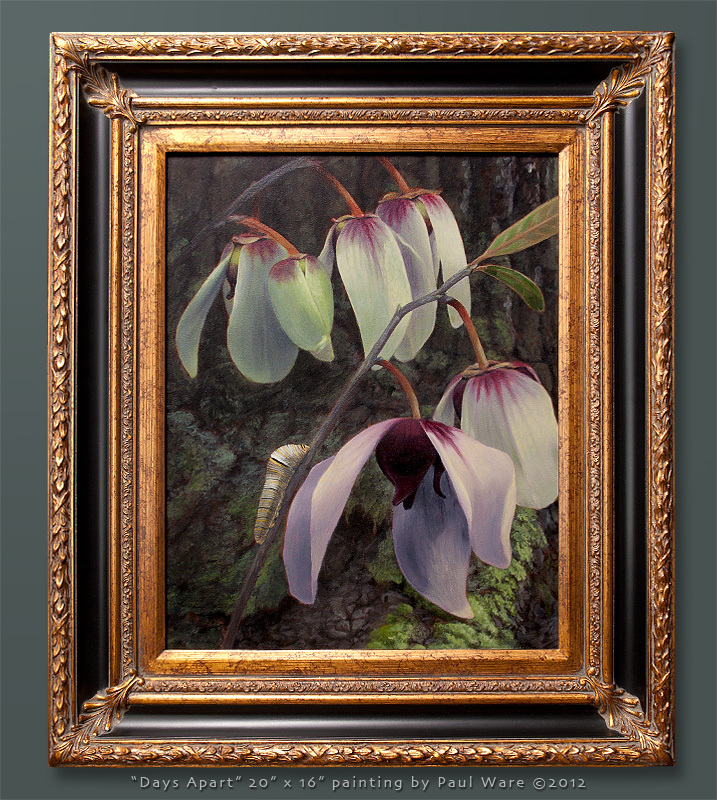 They are rather inconspicuous in the wild so few viewers of the painting will find the blooms familiar. Days Apart is an exploration of the color change that particular Pawpaw's bloom goes through over a few days. Those blooms are quite different from the creamy white blooms on the other Pawpaws near the studio (as shown in this photo). Here's a partial list of native plants I have identified around the studio. I'm honored that my latest Pawpaw floral painting will be part of the Ocala Art Group's juried exhibition at the Appleton Museum of Art in Ocala, FL. The 30 piece group show titled On The Balcony runs from May 19 to June 17, 2012. Opening day, Saturday May 19 from 10-5, is the Appleton's annual Community Day with FREE museum admission to the public plus OAG’s new Silver Toast to the Arts Art Fair. Drop by and help celebrate the 25th anniversary of the Appleton Museum of Art, College of Central Florida. The museum is well known for it's world-class permanent collections that include European, American and Contemporary art, plus Asian, African, Islamic and pre-Columbian artifacts and antiquities as well as hosting amazing temporary exhibits. OAG’s Silver Toast to the Arts one day Art Fair will be held in front of the museum with original paintings in oil, acrylic, watercolor, pen and ink, color pencil, mixed media, photography, ceramics, sculpture, jewelry, and wood turnings created by over 30 artists from throughout Central Florida. There will be live entertainment, food and children's activities. Food provided by Horse and Hound, Mo Jo Grill, and The Chocolate Factory. Entertainment includes Treblehawk, Ron Frosig, Town and Country, and Lonesome Willy Earle. Auditorium artists include Civic Chorale and Ocala Storytelling. The 20" x 16" Pawpaw painting is titled Days Apart for the way the blooms change appearance over time. This Pawpaw bush grows near my studio and is the most unusual variety I have encountered. The painting shows the blooms about two and a half times their actual size. The springtime blooms start out green and in a few days mature to a deep magenta with pink and creamy white drooping petals. 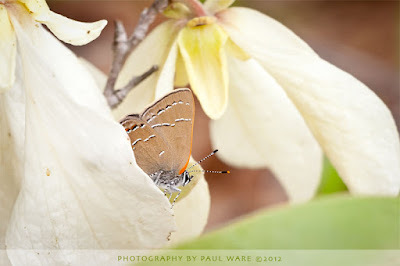 The Pawpaw is a host plant for the Zebra Swallowtail butterfly. We have numerous other native plants near the studio that we take great care to leave undisturbed. Some are short lived and were only present for a couple years after we disturbed the soil to build. Others like the deep rooted pawpaw I hope to enjoy for many years to come. What's more fun and lovable than a life-size painted horse that resembles a colorful, furry stuffed toy? 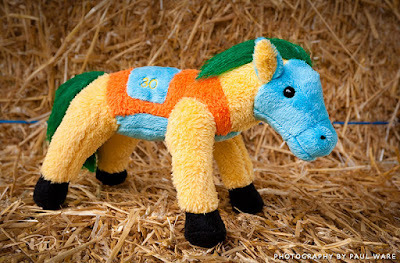 How about a real stuffed toy that resembles one of the new Horse Fever painted horses. That's exactly what Arnette House has created with the approval of MCA. Cuddly's sponsor, Arnette House, had this toy horse MADE IN THE USA! They look fabulous! Here's a photo of one of these fun loving horses hangin' out on the bales of straw by the studio. There's a whole herd of these cuties waiting to bring smiles to anyone young at heart... just in time for the holidays! all profit goes to support Arnette House, Inc.
Arnette House, Inc. offers emergency shelter services, non-residential counseling services, group homes and an Independent Living Program to youth and families in our community. They will be opening a Therapeutic Group Home within the next few months. drawn by the light, inc.
All images and text are Copyright 2010-19 Paul Ware and/or their respective owners. 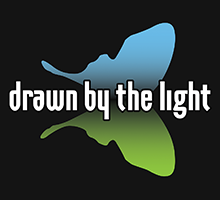 Drawn By The Light, Inc. is a design firm run by Paul Ware. For use of text or images in traditional print media or for any commercial licensing rights, please email Paul Ware for permission. All images and text are copyright 2010-19 Paul Ware and/or their respective owners. Powered by Blogger.